Are you looking to update your wall space, but want to go beyond a simple piece of art? A wall mount electric fireplace is probably what you’re looking for! Instead of a traditional fireplace, mounting a fireplace on the wall allows you to heat your room and save valuable floor space, all while giving your wall a decorative focal point. They can be installed in almost any room in your home, hotel, or restaurant. No vents or gas lines are required, making them a safe source of supplemental heat, producing no harmful emissions. Check out our wall mount electric fireplace comparison chart if you're still looking for that perfect decor piece for your wall. 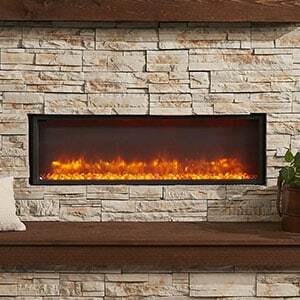 Wall Mount Electric Fireplaces: This is the easiest way to install an electric fireplace on your wall. You simply hang your fireplace on a bracket that is usually included with your purchase. This means that your fireplace will protrude from the wall approximately 4"-6" as it is on the surface of the wall, not in it. Since it is simply hanging on the wall, you can easily remove the fireplace whenever you want, or move to another room in your home. Recessed or Built In Electric Fireplaces: Electric fireplaces with the ability to be fully recessed give your wall a smooth, custom, built-in look. If you choose a recessed fireplace, please consult a professional electrician as you will most likely be hard-wiring your fireplace into your wall. These fireplaces will have the heaters on the front instead of the top or bottom, so the hot air can flow into your room. 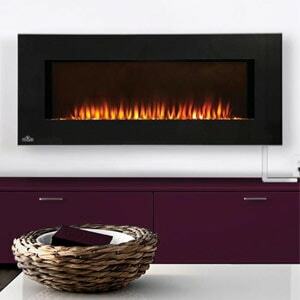 Depending on the brand, electric fireplaces can be semi-recessed or fully recessed. Semi-recessed fireplaces will still have a few inches protruding, but part will be recessed into the wall. This is a great option if you are retrofitting an electric fireplace into an existing wall opening. Before you get started, make sure you have the tools required to get the job done. For basic installations, you'll need a Phillips screwdriver, hammer, level, measuring tape, electric drill, pliers, and a ladder. Wall mount fireplaces can weigh up to 50 lbs., so it's important they are installed securely. For custom installations, you may need building supplies such as framing and caulking materials. If you have specific questions regarding the installation of your fireplace, please call our electric fireplace experts at 1-877-743-2269. Decide if you will be hardwiring or plugging in your electric fireplace. If you are hardwiring, we recommend using a professional electrician. If you choose to plug it in, you will generally need a 15 amp, 120 Volt outlet located near the fireplace. If you do not have an outlet, it may be best to consult a licensed electrician. Select a location that is not susceptible to moisture, dust, and is away from things that may catch fire or block openings. For the best look, install the fireplace out of direct sunlight and away from overhead lighting. Remove the fireplace, hardware and all packaging materials before installation. It's a good idea to test the fireplace to make sure it works correctly before mounting. Plug in the unit and turn on the fireplace using the control panel or remote. Store the fireplace in a safe and dry location until you are ready for installation. Mount the bracket onto the wall, and then use a level to make sure it is even. We recommend securing the screws into the wall studs where possible, otherwise, use plastic anchors. Ensure there are a minimum of two wall studs for a secure installation. Once the bracket is secure on the wall, lift the fireplace and hang it on the bracket. Check for stability, ensuring the fireplace will not pull free from the wall. First, review the dimensions of the wall opening and your fireplace to make sure it will fit properly. Once you are ready to install, remove the front glass panel. Follow your fireplace’s owner’s manual for any specifications on removing the glass. Lift the fireplace and slide into your opening. Screw the fireplace into the wall through the mounting holes. If the fireplace comes with media such as logs, glass, or embers, place these inside the fireplace at this point. When the media is placed how you would like, install the front glass panel back onto the front. Again, refer to the owner’s manual for any specifics. Turn your electric fireplace on using the remote or control panel, and enjoy the instant warmth and ambiance!